I have been involved in the design world and the printing industry for more than 20 years. I’ve been responsible for printing thousands of logos on thousands of different products. There are many important elements to consider when designing a logo — such as colors, style and your target audience. But too often, designers fail to consider one of the most important elements of a good logo — printability. When designing a logo, consider creating a horizontal and a vertical version of your logo. If your logo is tall, it will not print well on a pen. And if it’s too wide, it will never print well on a stress ball. By creating two versions of your logo (with the same basic elements), you open up endless possibilities for utilization of your logo. You may be surprised at how often you utilize your secondary layout of your company logo. Every logo needs to look good if it’s printed in one color. Convert your logo to one imprint color such as black. Does it still look good? Full color logos may be beautiful on your website, but are not always practical for printing. What happens when you put it on your fax cover sheet? What about in a B&W ad in the phone book? There will be times where you’ll need to print your logo small. Is your logo still readable if it’s only 1″ wide? Smaller? Print your logo at various sizes and make sure that it’s still readable and looks great at every size. This is another reason to create horizontal and vertical versions of your logo. Sometimes one of the two formats may work considerably better at smaller sizes. If your logo is unreadable when it’s small, you’ve got a problem. A shade or a screen of a color presents certain challenges when imprinting your logo. Let’s say your logo is in blue, and the designer has used several shades of the blue in the logo. Shades are printed by imprinting “dots” and leaving some of the background between the dots. The darker the shade, the more dense the printing of the dots. The easiest example is to think of a B&W photo in a newspaper where you can really see the dots. Well what happens if you want to order a blue coffee mug with your logo on it? You’ll probably want to print your logo in white. Well then what are you going to do with the screens of blue? I would certainly suggest that you have a version of your logo where only solid colors are utilized, preferably giving yourself an option to print a one color version of your logo without screens. Complex logos may be “cool”, but can often become a printing nightmare. Sometimes a simple logo can be more striking and memorable than a complex logo. And if you create a logo keeping in mind all of the elements we’ve discussed today, I bet you’ve already ended up with a logo that’s not too complex to print well. Your logo is important, and is often a first impression with a new client. Sometimes the most important ability for your new logo is printability. Good luck and happy marketing. 2010 Holiday Catalogs Have Arrived! Looking for some great gift ideas for your customers, employees or prospective clients? Well look no further. We’d be happy to send you a copy of The Gift Book 2010. This catalog features hundreds of promotional products and corporate gifts at many price points. Just a few of the products featured include custom wine bottles, holiday gift tins, chocolate boxes, desk accessories, clocks, photo frames, watches and art glass. Fill out and submit the catalog request form to get your copy today! 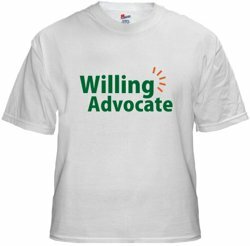 I’ve read several books and articles over the years about transforming employees into advocates. As business owners and managers, one of our greatest challenges is developing comprehensive strategies for recruiting, hiring, developing, rewarding and recognizing our employees. It’s these strategies and your company’s culture that can turn an employee into an advocate. It’s our employees who must carry our brand to our customers. Do your employees know what your brand is? Do they know the company mission statement? Can they convey what you do in 30 seconds or less? And as somebody who looks for every opportunity to market our business, there’s no reason that you can’t take advantage of these opportunities to promote your business to potential customers as well. Companies attend many types of functions to recruit potential employees such as job fairs and campus visits. It’s imperative to sell these recruits on your business. The top recruits will be interviewing you as much as you’re interviewing them. What impression do you want to give them? How will they remember your business? The giveaway you choose to give these recruits will tell them a lot about your business. Your first impression may be your only impression. During the interview process consider giving every interviewee a promotional gift decorated with your logo. It’s a great way to break the ice and introduce the candidate to your brand. Most companies will interview multiple applicants before filling a position. These people can become positive advocates of your business even when they don’t get the job if properly introduced to your company’s brand and culture. These people will move on to work for other businesses — businesses that could be potential customers of YOUR business. You want them to remember you, and remember you fondly. The right promotional giveaway is an excellent way to leave them with a positive impression of your company. Most applicants will require training once they’ve been hired. Make sure you spend time teaching them about your company’s mission and objectives. Whether it’s a coffee mug with the company’s mission statement printed on it, or a training manual with the company’s logo debossed on the cover, every employee must be included and integrated into the company culture. An employee who doesn’t understand the company’s mission is an opportunity lost. One of the most common frustrations among employees is that they feel unrecognized and under-appreciated. Creating programs for recognizing achievement and service at work is a great way to help develop a positive workplace environment. An employee who truly feels appreciated at work is much more likely to be productive and loyal. One of my favorite programs involves allowing staff to nominate other employees for employee of the month, and then vote on the winner. Nothing makes somebody feel more appreciated than recognition by their peers. Beyond recognizing your employees, incentives are often a great way to motivate your staff. Have clear objectives and rules of achievement, and reward your top performers with promotional gifts. Wellness programs have become a popular strategy for many progressive companies. Rewarding employees for improving their health is good for them, and good for you. Safety programs are another way to recognize desired behavior, and reward those who engage in safe conduct. Team building may sound cliche, but it’s vitally important. Employees must feel engaged by the company as well as their peers to become true advocates for your business. Participating in community events is one way to help solidify your team while building brand awareness. Volunteering time to help non-profit organizations not only helps the community, but instills employee pride in your business. Many businesses utilize corporate apparel and staff uniforms for employees. But what about businesses that do not require employees to wear company apparel? 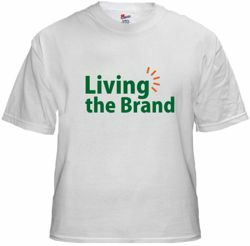 If your staff likes your company, they’re probably willing to wear corporate apparel whether you require it or not. One strategy is to pick a handful of items such as polos, hoodies and windbreakers, and offer them to your staff at reduced prices. Items like these that can be embroidered can typically be ordered in small quantities, and decorators typically don’t care if you mix and match different types of items if the embroidery is the same. You can limit options and colors that support your company branding, but allow your staff to pick sizes and products that best fit them personally. If they won’t wear it, it doesn’t do you any good. We belong to one of the local BNI chapters, and this week is Kristin’s turn to give the group presentation. We discussed a number of topics for her presentation and eventually settled on ROI and target marketing. So I thought it would be a good time to touch on these subjects here as well. This is not intended to be an in-depth discussion, but a group of ideas to get your wheels spinning in the right direction. I’m sure most of you are already familiar with this term, but in case you’re not, ROI is the cost of a marketing campaign relative to the profit generated during a certain period of time. 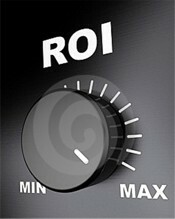 Now ROI doesn’t have to be rocket science, though it’s sometimes a challenge to develop a trackable plan. As a marketing professional, I try to break down the ROI of every marketing opportunity we consider. For our business we start by asking ourselves a few simple questions. How much revenue must we generate to break even on this opportunity? (Though your goal shouldn’t be to break even, it’s important to know where this tipping point is located.) And what is our projected revenue from the marketing investment? If we can’t answer these questions, then it’s probably not the right opportunity for us. Or if we don’t expect revenues to reach certain levels, we look for other opportunities. If you’re unable to measure the results of your company’s marketing plan, you need to reconsider your plan. You need to develop a plan that is measurable, and you must track the results. Can you be successful shooting from the hip? Sure. We all know business owners without a plan who have enjoyed spurts of success. But that’s a tough way to achieve success, and it’s particularly tough to thrive over the long haul without a good, measurable plan. Too often have I seen business owners give little thought to their target audience. If you’re a plumber, your target audience for a marketing campaign should not be “anybody with water pipes in their house”. The broader the audience, the more difficult it is to develop an effective marketing campaign. The more you refine your target audience, the more likely you are to succeed with your next promotion. Your targeted audience should coincide with how you position your company, and the image you want to portray. A plumbing company can do many things. Is your strategy to be the cheapest plumber in town? Is your strategy to be the company that specializes in installing high-end bathrooms? These would be two very different lists of prospective customers, and in turn, would require significantly different marketing campaigns to be successful. This is where we start to combine our trackable plan with our target audience. How many sales must you generate for your plan to be successful? What percentage of your audience can you convert into a sale? The more refined your target audience, the higher the return you should expect from an effective campaign. Having trouble making these predictions? That’s OK. Once again, that’s why it’s so important to track the results. Not every plan will generate the results you expect. And when presented with the same opportunity again, you can make even wiser decisions because you tracked the results the last time around. One of the reasons promotional items are effective is because they’re typically used to promote to a more refined target audience. Remember, the more refined your audience, the higher your expectations should be to convert prospects into customers. Where a radio spot or TV ad is broadcast (transmitted to a large undefined group), think of promotional marketing as narrowcast. Good luck, and happy marketing! A couple months ago we recommended First, Break All the Rules by Marcus Buckingham and Curt Coffman. 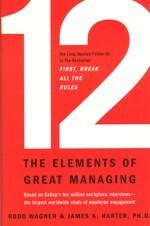 Now we’d like to recommend the follow-up, 12, The Elements of Great Managing by Rodd Wagner and James K. Harter. In the first book, the authors developed the 12 elements of job satisfaction — a group of carefully constructed questions for your employees. The answers to these questions will give you considerable insight into the overall satisfaction of your staff. Where the first book covered a greater swath of information, this book focuses on the 12 elements uncovered in the first book. Wagner and Harter do an excellent job of explaining each of the 12 elements in detail. Each chapter is dedicated to one of the elements, along with a real world example to provide context. And keep in mind, this isn’t just theory. These guys work for Gallup, and are utilizing the research from millions of employee and manager interviews to drive their results. The conclusions are based on measurable performance statistics. If you manage people, and would like to improve your managing skills, I highly recommend reading both of these books. Understanding employee satisfaction is a key element to a successful business. A couple weeks ago we discussed some of the most popular platforms for social media for a small business. (View this post.) The focus was on a company blog, facebook and twitter. This week we’ll dive into strategies for the development of content for these platforms. Most of us involved with small business have to wear multiple hats and don’t have the luxury of a full time copy writer. Hopefully you have somebody on your staff who can do a little writing. If not, there are some options for you that we’ll explore in a moment. Give some thought to what type of content would be valuable to your customers and prospective clients. What type of knowledge do you have that they do not? Obviously you don’t want to give away all of your trade secrets. But at the same time, if the content doesn’t have value to your customers, it won’t be effective in grabbing their attention. Let’s pretend that we’re a garden nursery, and that our primary business model is to sell plants, trees and shrubs. Don’t limit yourself to writing just about your specific products. Your content will be even stronger if you can also write around the periphery of your business — a great technique for not giving away all of your knowledge for free. The content needs to relate to your business, but this will open up the doors to many more ideas than if you limit yourself to only your core business. A few story ideas might be “Know when to fertilize your lawn” or “Grasses that grow well in Kansas”. Develop a list of potential story ideas. This is a great time for brainstorming ideas. Think about seasonal topics. Broad industry topics. And of course stories that relate to your specific products. Add to this list whenever new story ideas come to mind. Many of them you may never get around to developing into useful content, but the act of brainstorming and developing lists will help develop new ideas to write about. So you’ve decided how you can portray yourself as an expert in your field, and have developed a list of potential story ideas. Now give some thought to how you can share your content across different platforms. Do you do a company newsletter, either a print version or an emailed version? If not, this would be a good time to consider doing one. You’re already going to be developing content, and newsletters remain an effective way to promote your business. It’s not social media, but as small business people we must find ways to work efficiently and effectively. And sharing content across multiple marketing and social media platforms is a great use of our limited resources. So for our nursery we’ve decided we want to write an article on what types of plants thrive in direct sunlight that bloom during the summer months. (Can you tell I was gardening this last weekend?) For our newsletter, we’re going to write an extended version of this content — anywhere from ten to twenty paragraphs of information. This fits well into our company’s printed newsletter as our feature article. Keep the article informational, and not salesy. It’s OK to give it a little personality if you can, but the point is to develop content that is useful for your customers. After this is done, you can now cannibalize the content for the rest of your media needs. If the content isn’t too long, you can use it on your blog, or condense it to a more blog-friendly length. Use the first few paragraphs in your e-newsletter with a link to the complete article on your website. Post some short quips on your facebook page — you might even be able to pull multiple short quips so that you can post content on facebook on several different occasions from this same story. And finally, you need a few very short quips for tweets. This is a fine strategy for what I would call your core content. Your feature articles. Spend a couple hours writing an article then use it across all of your promotional platforms. But you’ll also need to develop some shorter content for your social media as well. You will need to mix in some quickies into your social media. This is the best place to let your personality shine. Where your newsletter needs to be a bit more serious, let your hair hang out a bit with your facebook posts and tweets. Comment on special things that are going on at your business. Maybe you’re excited about a new product and want to share a picture and a quick description. Maybe you want to let people know about a special award you’ve received, or a community project you’re involved in. Or maybe you just want to say TGIF! Let me give you a quick piece of advice: people like to do business with people they like. Let them get to know you better through your posts and tweets. Let them see some character and some personality. So you say that you can’t write? And nobody on your staff wants to do it either? There are options. If there’s a college in your area, make friends with somebody in the journalism department. College students need experience, and often come cheap. Look around your community, there are probably a number of freelance writers who work from home. Do you belong to any trade organizations? They may have outlets where you can buy content or hire writers. And there are many online communities of writers where you can post your needs for a freelance writer. Well what are you waiting for? Get to it. And happy marketing. Sometimes just getting started with something new can be intimidating. Social media sounds a little scary. And many small businesses are still trying to discover how they can implement social media into their marketing plans. It’s really not that difficult. And it doesn’t have to be that time consuming. But it does take a little understanding and planning. You’ve probably heard of Web 2.0, but have wondered what it means. It simply signifies the second generation of usage of the Internet to convey information to clients. If you think of Web 1.0 as simple websites — basically brochures online — then Web 2.0 is the next step of actual interaction online with your customers. Today we’ll cover some of the basics of the most commonly used systems for interacting with your customers online: blogs, Facebook and Twitter. Blogs have been around so long that people tend to forget about them as part of Web 2.0, but they’re an important element of your online marketing plans. For years we’ve instructed companies to find ways to make their website informative and useful. Ways to keep the content fresh and up-to-date. And ways to keep visitors returning to your website. A blog is an excellent vehicle to do just that. Though we’ll discuss next time more in-depth ways to develop content for a blog, think about what type of information would be useful to your clients and prospective customers. 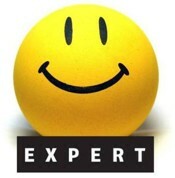 Think about how you can position yourself as an expert with valuable knowledge. There are a number of ways to create a blog. There are online services such as WordPress and Blogspot that make it quite easy to start a blog. But the best method is to add a blog directly to your website. There are a number of benefits to adding the blog to your site. In particular, it allows you greater control of the look and feel of the blog, and the search engines will like your site more if the blog is part of your site. I suggest the blog to go somewhere like: www.YourSite.com/blog/. You can check with your hosting company to see if adding the blog to your current website is possible. With many of the national hosting companies, adding a blog to your site is as simple as a few clicks. I’d give you a link to our blog, but you’re already on it! I have to admit that I’d been a bit slow to embrace Facebook. But now that I have, I’ve certainly found it to be enjoyable. It’s allowed me to re-connect with plenty of old friends. And it has opened up doors to plenty of potential customers. You want to make sure you setup what Facebook calls a “fan” page, and not a personal page, often referred to as a profile. With a fan page, anybody can view the content on the page. And anybody with a personal Facebook profile can “like” your page. Once a person “likes” your page, which for them as as easy as a mouse click, when you post something on your fan page, it places the comment on your fans’ news feed. You can view our Facebook page here. Facebook made a recent change to how customers interact with your fan page. In the past, they used to refer to this as “become a fan”, but now it’s just a “like” button on your fan page. As far as I’m concerned, the jury is still out on the effectiveness of Twitter for a small business. Though I would still implement this as part of your Web 2.0 marketing plan. Twitter is a way to quickly and easily convey small bits of information to your followers. People with Twitter accounts decide to “follow” people and businesses. And when the people and businesses they follow tweet, post a comment on their Twitter account, the tweet shows up in the follower’s Twitter feed. The drawback is that unless most of your customers are college students, they’re probably not using Twitter. But many businesses are beginning to use Twitter, and it’s better to be on the front of this curve than behind it. You can view our Twitter account here. Integrating Web 2.0 into your company’s marketing plans is smart business. Learning how to develop content is the next step in utilizing social media for a small business. Next time we’ll talk about how to develop content, and how to efficiently and effectively utilize that content across your different applications. So until then, happy marketing! Like many people, I’ve continued to look for ways for self-improvement. As a small business owner and entrepreneur, much of what I have learned about business has come from experience. Learning on the job. And a lot of trial and error. A few years ago I was faced with running a business that had rapidly grown from a staff of five to more than 40 full-time employees in a few short years. My duties and responsibilities changed significantly. And I quickly realized how little I knew about managing people. 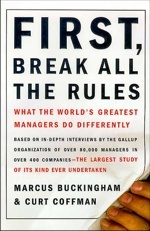 I was glad to have found First, Break All The Rules, What The World’s Greatest Managers Do Differently by Marcus Buckingham and Curt Coffman. While I enjoy reading about business, leadership and motivation, I’m particularly drawn to books that have a legitimate methodology to their process and conclusions. First, Break All The Rules does this as well as any book I’ve ever read. This book is based on data from ongoing surveys conducted by the Gallup Organization over a 25 year period. They’ve interviewed more than 80,000 mangers across many industries trying to determine what makes a great manager. And some of the results will certainly surprise you. It did me. Are you a great manager? Would you like to be a better manager? Understanding what creates a satisfied and productive staff is a great place to start. Find out what really motivates employees. Whether you’re a small business owner with a handful of employees, or a corporate executive at a Fortune 500 company, I highly recommend First, Break All The Rules. All rights reserved. Copyright 2009-2016.